Rare Black Leopard Seen In Kenya There have been lots of stories about the unique animal in central Kenya's Laikipia County. Now cameras have captured multiple high-quality photos and video. A rare black leopard, caught on camera in Laikipia Wilderness Camp, Kenya. The elusive black leopard has been sighted. In Kenya, the vast majority of leopards have a light coat with dark spots. A tiny minority of them have a genetic mutation called melanism that causes them to appear all black in the daylight. According to San Diego Zoo Global, the spots show up in infrared imagery at night. There have been lots of stories about the unique animal in central Kenya's Laikipia County, the location of multiple recent sightings. San Diego Zoo Global researchers captured footage of a black leopard there in early 2018 and published their research in late January 2019, in the African Journal of Ecology, in what is believed to be the first sighting since 1909 of the rare type of animal in Africa since 1909 published in scientific literature. 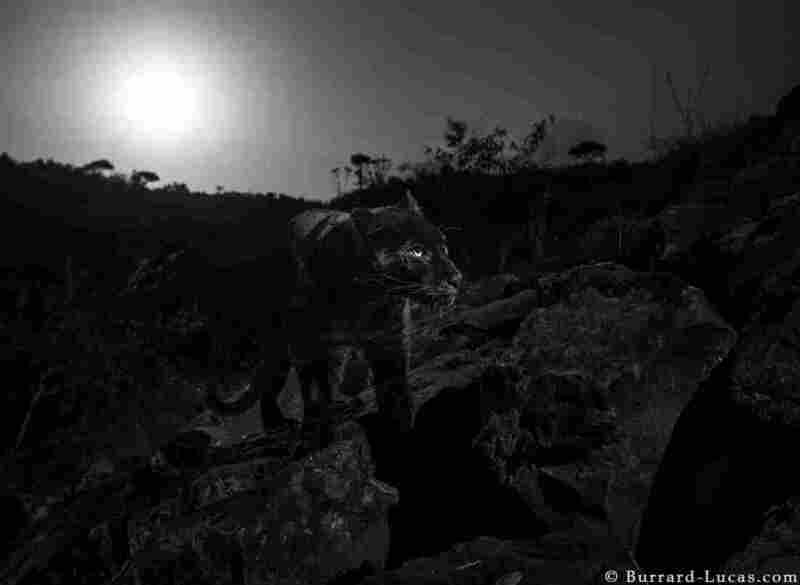 Separately, wildlife photographer Will Burrard-Lucas captured high-quality photos of a black leopard there last month. Nicholas Pilfold, a scientist working on the San Diego Zoo Global's leopard conservation program in the area, says that getting any leopard on camera is a challenge. "They're a very elusive cat," he told NPR. "And then to get black leopards, wow, the first time I got that I was very, very happy, very surprised." Burrard-Lucas, the wildlife photographer, had also heard reports of black panther sightings in the area and traveled to Kenya to try to capture photos of his own. "I have never seen a high-quality image of a wild black leopard come out of Africa," he said in a blog post, but then he heard about a sighting at Laikipia Wilderness Camp in Kenya. A local resident said she had seen one recently, and another pointed out fresh leopard tracks. 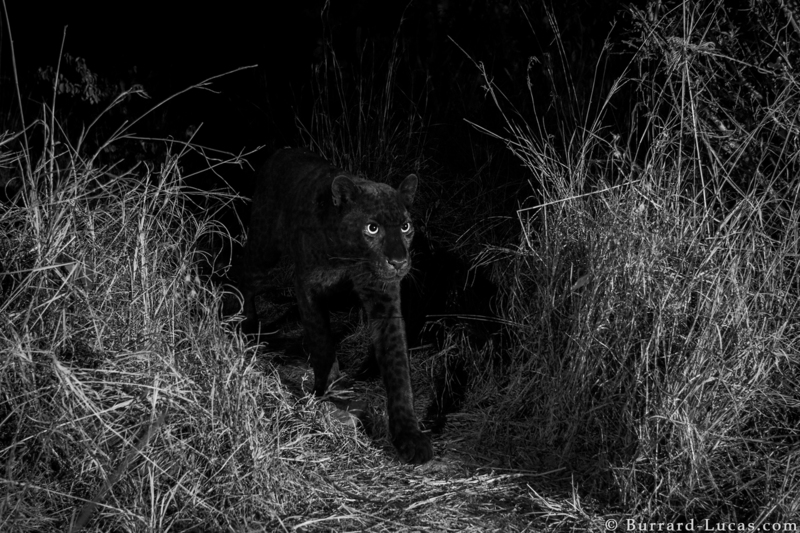 "As I scrolled through the images on the back of the camera, I paused and peered at the photograph below in incomprehension... a pair of eyes surrounded by inky darkness... a black leopard!" he wrote in a blog post. "I couldn't believe it and it took a few days before it sank in that I had achieved my dream." On another night, one of his cameras managed to capture the leopard in the light of a full moon, prowling through the darkness. "As far as I know, these are the first high-quality camera trap photographs of a wild melanistic leopard ever taken in Africa," Burrard-Lucas wrote. Burrard-Lucas and Pilfold's team were working separately, but they believe they captured images of the same leopard. Does this animal remind you of a superhero in a certain critically acclaimed film? Black leopards are actually a type of black panther — made famous by the Marvel Comics character of that name. "Black panther is a general term that covers any black big cat," Pilfold said. "So black jaguars in South America, for example, are a type of black panther. And any black leopard in Africa and Asia is a type of black panther." That superhero character was from the fictional country of Wakanda. "It is interesting [because] the fictional country of Wakanda where Black Panther is set is meant to be, in the Marvel universe, in East Africa, not too far away from where we're working," said Pilfold. It's worth noting that while light-coated leopards with dark spots are much more common than black leopards in this area, that's not true everywhere. For example, the researchers noted that a different subspecies of black leopard is much more common than lighter spotted ones in certain parts of Asia.